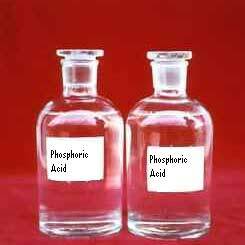 The company is one of the most reliable Phosphoric Acid Exporters and Suppliers, based in India. The Phosphoric Acid offered by us is a mineral acid that is most commonly used in America's most favorite soda âï¿½ï¿½Coca Colaâï¿½ï¿½. Having a formula H3PO4, the quality-tested Phosphoric Acid that we provide is available in the markets at very affordable prices.